Lead generation takes enormous effort-are you positive you’re getting the most out of every lead? Phonexa’s Lead Management System, LMS SYNC, gives you the tools to effectively generate, track, and distribute leads, using custom filtration and network integration that ensures you unlock every lead’s full value. Knowing which ads are bringing in the most leads is fundamental for your business. 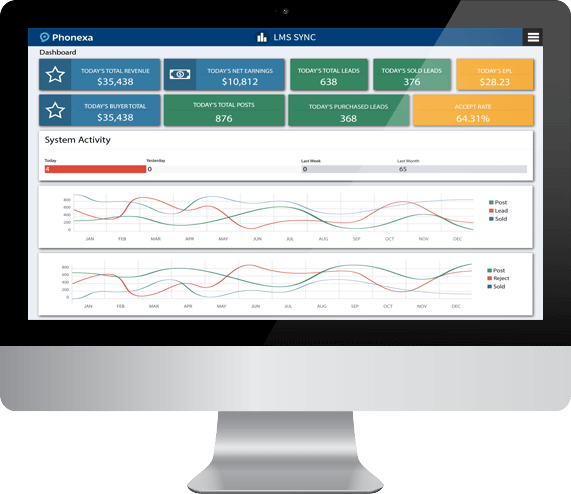 Phonexa’s Lead Management System, LMS SYNC, tracks how every one of your ads performs, giving you critical market insight. Ensure you only get quality leads with our custom filtration system, then keep close tabs on every lead with our intuitive display. Phonexa’s LMS SYNC platform opens up new opportunities for your leads with advanced lead distribution. Our ping tree technology gives you the portal through which you can redistribute your leads and increase your revenue. In lead generation, data is king—and LMS SYNC makes it easier than ever to view and understand the flood of information that comes in with every campaign. Our real-time reporting gives you the ability to see marketing trends develop as they happen, giving you the opportunity to make critical changes. And with Predictive Modeling, that data becomes a roadmap that you can follow to find more earnings in the future. LMS SYNC tracks everything about your leads so that you can focus on conversion and distribution. From the moment an ad, email, or paid search link is clicked, your prospects are followed closely by LMS SYNC so that you can have a complete understanding of each costumer’s journey. By the time a lead fills out your optimized forms, you’ll have a clear vision of the likelihood of conversion and be able to nourish that lead. Analytics | Analyze the effects of your campaign optimizations and keep track of detailed customer behavior through meaningful data and statistics. Tracking | Build effective campaigns and drive more revenue by tracking advertisement performances, customer details, and more in real-time with comprehensive tracking tools. Lead Distribution | Expand your revenue margins by distributing your leads to additional buyers through a multi-tier Ping Tree. Real-Time Reporting | Stay updated on your ongoing campaigns and leads status with detailed, real-time reports sent straight to your inbox. Predictive Modeling | Phonexa’s premier analytics solution gives you a thorough visual analysis of your web and call leads with detailed analytics, comparison data, and predictive insights. Interactive Management | The user-friendly management dashboard simplifies the lead tracking process to help you better analyze your ROI and make effective campaign optimizations. Filtering and Restrictions | Filter your leads according to their sales status and set access limits to other LMS users with the granular filtering and restriction features on LMS SYNC. URL Tracking Capabilities | Monitor your URL clicks and campaign performances on a per-lead level. Payout Structures | To accommodate your preferences, we offer a variety of different payout options for greater convenience. Fraud Detector and Email Verification | Our advanced fraud detector and multi-step verification process ensure that only high quality leads pass through to increase your overall conversions.